There has been a lot of attention given to the Cassini mission at Saturn lately, but meanwhile, NASA’s Juno probe also continues to be busy studying the largest planet in the Solar System, Jupiter. Juno is now revealing more of the giant planets’ secrets, and the first science resultshave now been published, which were presented last week at the European Geosicences Union meeting. As is common in planetary science, the new findings include significant surprises. As it turns out, Jupiter’s interior seems to be rather different from what had been expected. Being a gas giant, Jupiter doesn’t have a surface as such below the atmosphere, it just gets progressively denser the farther down you go until you reach (as thought) a small, solid core. Previous models of Jupiter’s interior had been based on gravitational measurements of the planet, but the new findings appear to suggest something different. Jupiter’s interior, beneath the deep and turbulent atmosphere, was thought to be fairly uniform, with a shallow outer layer of liquid hydrogen overlying a thinner layer. In that thinner layer, it would “rain” helium. Farther down was a deeper layer of metallic hydrogen, and finally a smaller solid core, about 43,000 miles (70,000 kilometers) down. But now it seems, from Juno’s data, that those layers are not as uniform as previously thought. Instead of a solid core, the data suggests that Jupiter has a more “fuzzy” core, which is dilutely mingled with the overlying metallic hydrogen layer. In short, Jupiter’s interior is more complex that first thought, which is an exciting find for scientists who want to understand how larger gas planets form and evolve. The surprises also include the atmosphere as well. It’s been known for a long time that Jupiter has ammonia clouds, but Juno found that there is a dense, deep zone of ammonia gas around the equator, something not expected. Another parts of the atmosphere, ammonia is depleted, which is evidence for amonnia-based weather systems on Jupiter. The new findings also extend beyond the planet itself as it were, with the discovery that Jupiter’s magnetic field is stronger and more irregular than first thought. The strength of the magnetic field was previously estimated to be about 5 gauss (compared to 0.25 to 0.65 gauss for Earth), but Juno found it to be possibly as high as 8-9 gauss. The dynamo which drives the magnetic field is now thought to be closer to the surface than expected. In March, Juno completed its fifth close flyby of Jupiter. Closest approach occurred on Monday, March 27, at 1:52 a.m. PDT (4:52 a.m. EDT, 8:52 UTC). All of the spacecraft’s science instruments were operating during the flyby; scientists now have even more data to go through from the mission so far. Juno has also found previously unseen swirling cyclones in Jupiter’s atmosphere, similar to cyclones on Earth, but much larger. Juno has also seen other white ovals, in the cloud belts south of Jupiter’s equator. Their composition isn’t known for certain yet, but according to Alberto Adriani of the Institute for Space Astrophysics and Planetology in Rome, Italy, they likely contain ammonia and hydrazine. On Earth, hydrazine is used in rocket fuel. As well as the atmosphere, Juno has also been studying Jupiter’s auroras. These are again similar to what we see on Earth, but more intense. The regions at the poles where they occur are composed mostly of methane and an ion containing three hydrogen atoms (H3+), at temperatures ranging from 500 to 950 kelvin. And of course there are the images. Juno has been taking the highest-resolution images of Jupiter during its mission, including of the polar regions. They can often look like works of art – the clouds, storms and eddies in the atmosphere appearing like they were painted by a cosmic hand. Jupiter’s visible atmosphere is extremely turbulent, but that just adds to its beauty. The camera itself has also proven to be more resilient than anticipated, despite being hit by Jupiter’s radiation on an on-going basis. “The good news is radiation damage so far is almost negligible, so it will operate for many years,” Orton said. Last February, it was announced that Juno would remain in the same orbit for the remainder of its mission, due to a problem with the main engine. This doesn’t adversely affect the health of the spacecraft, but it means that Juno won’t be able to orbit even closer to Jupiter. The orbit it’s in right now is an elongated 56-day orbit. Juno was supposed to then switch to a closer, 14-day orbit, but the engine problem meant that the new orbit might be less than desirable, so it was decided by the mission team that the spacecraft would remain in the same orbit it is in now, for the rest of the mission. That won’t affect the science obtained too much however. It also means that the spacecraft will be subjected to less radiation overall, another plus. Apart from Juno, the Hubble Space Telescope also recently took some breathtaking new images of Jupiter, showing the well-known distinctive dark bands and the Great Red Spot. Hubble is able to see features as small as 80 miles (130 kilometers) across in Jupiter’s atmosphere. Juno’s next closest approach to Jupiter, the sixth flyby, will be on May 19, which will include flying over the Great Red Spot, the most well-known feature on Jupiter. This will be a chance to study the massive and long-lived storm in more detail than ever before. “It means that for the first time, we can go down deep and find out what’s going on underneath,” Fletcher said. NASA's Juno spacecraft will make its fifth science flyby over Jupiter's mysterious cloud tops on Thursday, May 18, at 11 p.m. PDT (Friday, May 19, 2 a.m. EDT and 6:00 UTC). At the time of perijove (defined as the point in Juno’s orbit when it is closest to the planet's center), the spacecraft will have logged 63.5 million miles (102 million kilometers) in Jupiter’s orbit and will be about 2,200 miles (3,500 kilometers) above the planet's cloud tops. Monstrous cyclones are churning over Jupiter's poles, until now a largely unexplored region that is more turbulent than scientists expected. 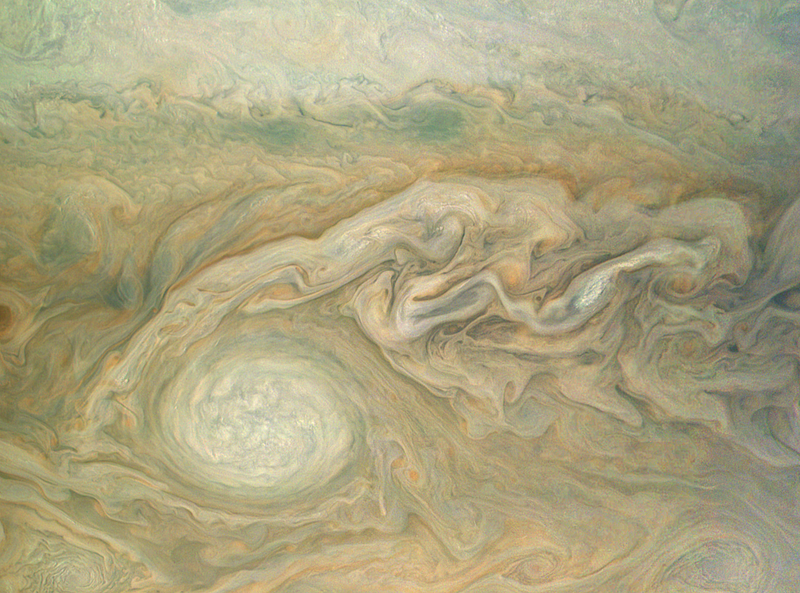 NASA's Juno spacecraft spotted the chaotic weather at the top and bottom of Jupiter once it began skimming the cloud tops last year, surprising researchers who assumed the giant gas planet would be relatively boring and uniform down low. "What we're finding is anything but that is the truth. It's very different, very complex," Juno's chief scientist Scott Bolton of the Southwest Research Institute said Thursday. With dozens of cyclones hundreds of miles across — alongside unidentifiable weather systems stretching thousands of miles — the poles look nothing like Jupiter's equatorial region, instantly recognizable by its stripes and Great Red Spot, a raging hurricane-like storm. "That's the Jupiter we've all known and grown to love," Bolton said. "And when you look from the pole, it looks totally different ... I don't think anybody would have guessed this is Jupiter." He calls these first major findings — published Thursday — "Earth-shattering. Or should I say, Jupiter-shattering." Turning counter-clockwise in the northern hemisphere just like on Earth, the cyclones are clearly clustered near the poles. The diameters of some of these confirmed cyclones stretch up to 1,700 miles (2,800 kilometers). Even bigger, though shapeless weather systems are present in both polar regions. At the same time, the two poles don't really resemble each other, which is puzzling, according to Bolton. Scientists are eager to see, over time, whether these super cyclones are stable or dynamic. "Are they going to stay the same way for years and years like the Great Red Spot ... Of course, only time will tell," Bolton said. Launched in 2011 and orbiting Jupiter since last summer, Juno is providing the best close-up views ever of our solar system's largest planet, peering beneath the clouds for a true portrait. It's made five close passes over Jupiter so far for science collection, the most recent last week; they occur about every two months given Juno's extremely oblong orbit. The next one will be in July, with investigators targeting the Great Red Spot. Besides polar cyclones, Juno has spotted white ice caps on Jupiter — frozen bits of ammonia and water. Bolton refers to them as Jovian snowfall — or maybe hail. Juno also has detected an overwhelming abundance of ammonia deep down in Jupiter's atmosphere, and a surprisingly strong magnetic field in places — roughly 10 times greater than Earth's. It's also led scientists to believe Jupiter may have a "fuzzy" core — as Bolton puts it — big but partially dissolved. Then there are the eerie sounds of plasma waves at Jupiter — "nature's music," according to Bolton. During the teleconference, he played two minutes of the spacecraft's recording from February, adjusted for the human ear and full of percussion sounds as well as high-pitched beeps and squeals, and even flute-like notes. Jupiter's poles appear dramatically different from neighboring Saturn's, according to the scientists, with nothing like the hexagon-shaped cloud system over Saturn's north pole. Researchers hope to compare Juno's observations with those of NASA's Cassini spacecraft, in its final months orbiting Saturn. Juno's findings are "really going to force us to rethink not only how Jupiter works, but how do we explore Saturn, Uranus and Neptune," Bolton said. The first close-up observations from Nasa’s Juno spacecraft have captured towering clouds, swirling cyclones and dramatic flows of ammonia that drive giant weather systems on the largest planet in the solar system. The $1.1bn probe swung into orbit around Jupiter in July last year on a mission to peer through the thick clouds that shroud the planet and learn how the alien world, and ultimately all of the planets in the solar system, formed around the nascent sun 4.5bn years ago. The spacecraft survived an almost six-year, 2.8bn km voyage across the depths of space to reach its destination, where it ducked beneath Jupiter’s intense radiation belts, turned on its suite of instruments, and swept into an orbit that loops over the planet’s north and south poles. From 5,000km above the brown-orange blanket that covers the planet, Juno’s camera snapped pictures of tall, white storm clouds standing high above the rest. Some were so high, they stood out even on the nightside of the planet, betrayed by the feeble light of the sun glinting off them. Described as a “planet on steroids” by Scott Bolton, the mission’s principal investigator at the Southwest Research Institute in San Antonio, Jupiter is an enormous gas giant made from hydrogen and helium. Compared with Jupiter and the sun, the rest of the solar system is an afterthought. All of the other planets, the asteroids and comets, would fit within Jupiter, a planet 11 times wider than Earth. Writing in two papers in the journal Science today, the Juno team describe fresh images and measurements of the planet’s atmosphere, magnetic field and the brilliant non-stop lightshows that constitute the aurorae at Jupiter’s poles. Another instrument on Juno measured the magnetic field of the planet and found it to be twice as strong as scientists expected, at about ten times greater than the field that surrounds Earth. During observations of the planet’s intense aurorae, Juno detected streams of electrons hurtling down into Jupiter’s upper atmosphere, where they potentially power the spectacular light shows. Over the coming months, Juno will build up an unprecedented map of the planet’s interior before its instruments succumb to the harsh radiation and the spacecraft plunges into the clouds at the end of its mission. Along for the ride are three Lego crew members: the Roman god Jupiter, his wife Juno, and a telescope-wielding Galileo, who discovered four of Jupiter’s 53 moons. Early science results from NASA’s Juno mission to Jupiter portray the largest planet in our solar system as a complex, gigantic, turbulent world. WASHINGTON, DC — Early science results from NASA’s Juno mission to Jupiter portray the largest planet in our solar system as a complex, gigantic, turbulent world, with Earth-sized polar cyclones, plunging storm systems that travel deep into the heart of the gas giant, and a mammoth, lumpy magnetic field that may indicate it was generated closer to the planet’s surface than previously thought. Juno launched on Aug. 5, 2011, entering Jupiter’s orbit on July 4, 2016. The findings from the first data-collection pass, which flew within about 2,600 miles (4,200 kilometers) of Jupiter’s swirling cloud tops on Aug. 27, are being published this week in two papers in the journal Science, as well as a 44-paper special collection in Geophysical Research Letters, a journal of the American Geophysical Union.